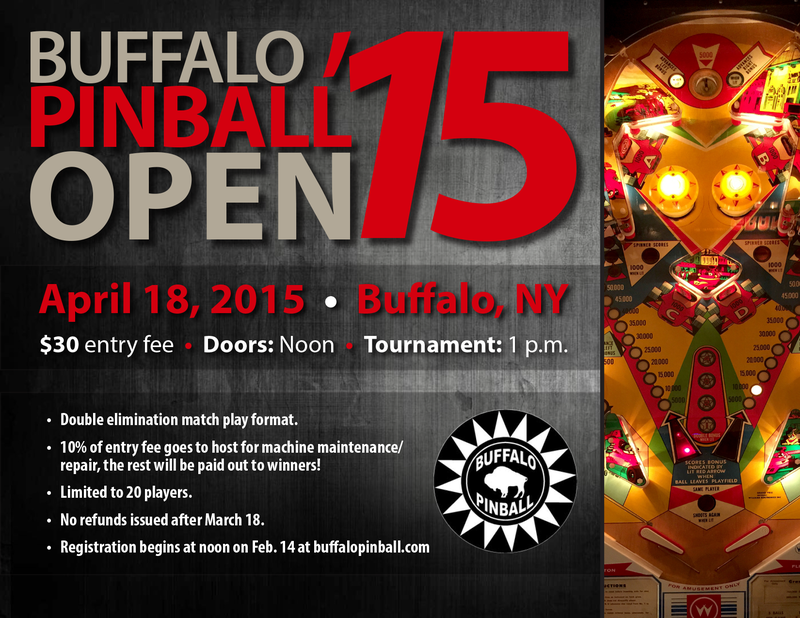 Here comes our first tournament of 2015, the third annual Buffalo Pinball Open! 10% of entry fee goes to host for machine maintenance/repair, the rest gets paid out to winners (cash + trophies)! This tournament is open to all and registration begins at noon on Feb. 14 right here at buffalopinball.com. Tentative list of games: Iron Man, Metallica, Whirlwind, Operation Thunder, Bram Stoker’s Dracula, Countdown, and Grand Prix–with more to come! Registration will be granted on a first-come, first-served basis. No refunds will be issued after March 18. If needed, a waitlist will be kept for players beyond the 20 player limit. The exact address for the event will be sent via email to all registered players. See you there! This entry was posted in Tournaments on January 30, 2015 by k3v2.